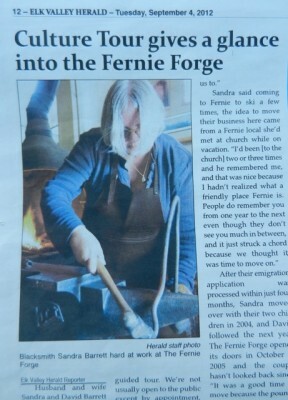 Reporter Nicole Liebermann came to Fernie Forge and interviewed Sandra about the forge and the Columbia Basin Culture Tour. Nicole’s report was published by the Elk Valley Herald on September 4 2012. To read the full article click on the link below. Copyright © Fernie Forge 2019. All Rights Reserved Worldwide.